Combining a luxurious setting with first-rate amenities, the Tryp Albayzin Hotel features a sauna and a fitness centre. This 4-star hotel is just a stone's throw from Centro's lively nightlife. The hotel has 106 rooms and has been recently refurbished. The hotel also offers a ballroom, limited hours room service and a 24 hour reception. A safe, a laundry service and laundry facilities are also available at the hotel. The air-conditioned rooms at the Tryp Albayzin Hotel are comfortable. A mini bar, cable / satellite channels and a private bathroom can be found in each room of the hotel. 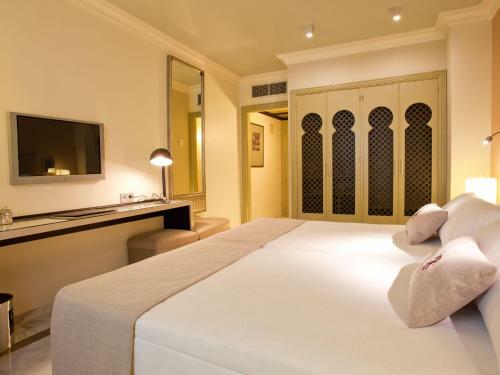 Complimentary toiletries, a TV and a hair dryer are also provided in every room. To ensure your day gets off to a great start, the hotel provides a buffet breakfast daily. For other meals, there are many restaurants and cafés situated close by. Located close to a number of popular hot spots, the hotel is near many bars, nightclubs and quality places to eat. The Palacio de Exposiciones y Congresos and the Plaza Bib-Rambla are within a quick 10 minute walk of the hotel. This hotel is 1189 metres from the Alhambra entrance, 779 metres from Plaza Nueva (the absolute centre of Granada), 2090 metres from the train station and 3661 metres from the bus station.